We hope everyone thoroughly enjoyed the holidays and had an exciting New Year’s Eve Celebration to ring (or bring, you choose!) in the New Year! As a Washington MAST Permit holder, or as someone who serves or sells alcohol in Washington State, one of the most important legal duties you’ll have is to ensure that everyone you serve or sell alcohol to is at least 21 years of age. One of the easiest ways to do this is to take a look at your customer’s birth year when they hand you their ID and compare it with whatever year was 21 years ago. 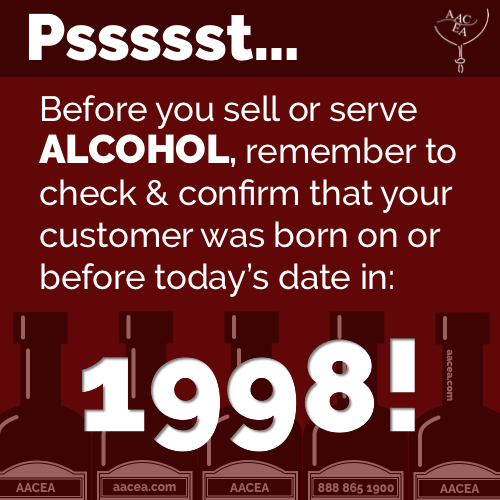 In 2019, the year you will want to reference when checking an ID to confirm a customer is over 21 is 1998! P.S. If you're in need of a Washington MAST Permit, we've got you covered! Sign up to receive Top-Shelf-Worthy Training and a MAST Permit that will be valid for 5 years!